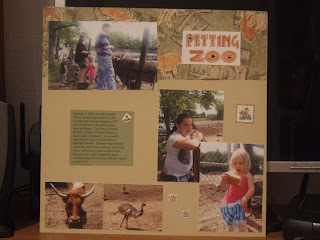 This is another layout from our last trip to CT. Jeff's uncles family owns a small little farm and they house the animals across the street from their home (they have loads of land) and people go there all the time to feed the animals (ostrich, bulls, ducks, cows, etc). My sister in law takes the kids there once a week, they love it. On this particular occasion Summer was in shock when she pulled the bread out of the bag and it was green (molded). It was funny, she quickly gave the bread to Uncle Jeff (see the look on her face in the picture bottom right). Embellishments: title and embellishments are from my stash, its a 12x12 sheet that you cut out of different zoo embellishments.